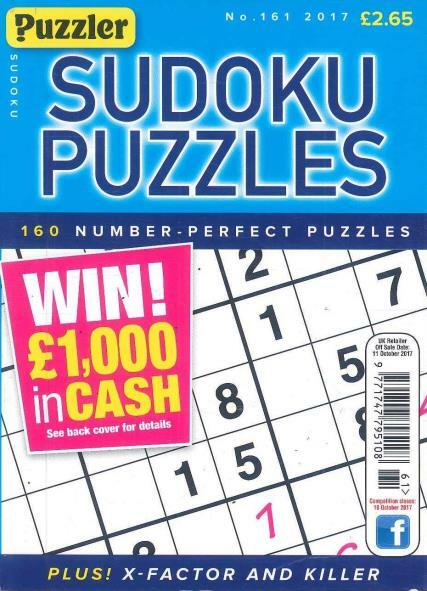 Sudoku Puzzle Magazine provides you with new and exciting Sudoku (pronounced soo-doh-koo) puzzles to solve in each issue. The principle behind Sudoku, the new rage in number puzzles is to use common sense and logic. The objective in any Sudoku puzzle is to complete the numeric puzzles each which have a grid with nine squares wide and nine squares deep. Each puzzle will have some of the numbers already in the grid and it is up to you to complete the grid so that each row, column and box has all the numbers from one to nine. Sudoku Puzzles Magazine will provide hours of entertainment as you use different techniques to solve the puzzles. There are over a hundred puzzles in each issue and they range from the simple to the really difficult. There are also contests in every issue. Take Sudoku Puzzles Magazine with you when you travel or give a subscription as a gift to the person you know who loves solving puzzles.